Kiwi Property is pleased to announce that it has secured IAG New Zealand (IAG) as an anchor tenant for a new $80 million office tower to be constructed at Sylvia Park Shopping Centre. The new 10-level building will be constructed in the airspace above the shopping centre, seamlessly integrating with a ground level extension to the existing dining lane, in keeping with Sylvia Park’s evolution as a town centre. Nine levels of office accommodation, totalling approximately 11,370 sqm, will be situated over a new 800 sqm ground floor alfresco dining precinct adjacent to a new landscaped town square. IAG has agreed to a 12-year lease of 3,324 sqm of space within the office complex, representing approximately 29% of total office floor space. 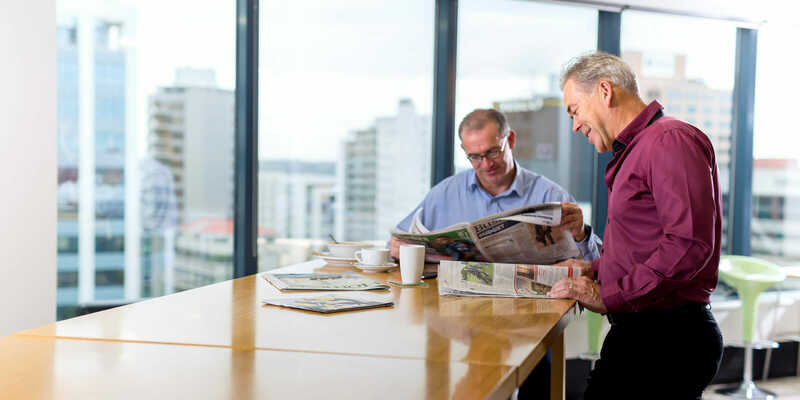 “We are delighted to have secured IAG as our first tenant, and we are experiencing strong interest from other businesses attracted by a Sylvia Park location,” said Mr Gudgeon. Enabling works for the new office complex will begin this month, with construction due to complete in May 2018 in time for IAG’s lease commencement in June 2018. > Efficient floorplates of approximately 1,250 sqm. > ‘Vertical villages’ or inter-floor atria connections between blocks of selected floors. > Ability to introduce fresh air to enclosed internal ‘balconies’ through opening windows. > 5-star Greenstar design rating and NABERSNZ base building 4-star energy rating. > Bike parks and end-of-trip facilities. > Three metre floor to ceiling height on typical office floors. > Lobby level café and casual meeting spaces. The expected incremental net income yield on total project cost is 6.7% and a 10-year internal rate of return of circa 8.8-9.0% is projected. The value on completion is anticipated to be approximately $87.5 million. > New international brands and concept stores including selected retailers from Sylvia Park’s current waiting list of specialty tenants. > A next-generation, relaxed, sophisticated and welcoming ‘café court’ with eight experiential dining offers. > Potentially one or more department stores. > New multi-deck carparks with seamless transition from the surrounding road network. > Car parking assistance provided by a new user friendly digital wayfinding system, similar to that currently being rolled out in the existing centre. A total project cost for the retail expansion stage of approximately $180 million is projected, with construction potentially starting in 2017 with staged completion between 2019 and 2021, depending on progress with pre-leasing activities now underway. Combined, the total estimated cost of the company’s current retail expansion and office development plans is approximately $280 million. New Zealand’s largest shopping centre, Sylvia Park, is located at the heart of Auckland, with unparalleled exposure and accessibility. It draws customers from across the city and beyond, attracting annual sales of more than $455 million. Developed and built by Kiwi Property, this award-winning centre offers quality retail space anchored by The Warehouse, Hoyts Cinemas, PAK’nSAVE and Countdown, along with an extensive range of quality specialty tenancies. The first stores in New Zealand for international fashion retailers H&M and Zara are scheduled to open in spring 2016. An artist’s impression of the office building has been provided to NZX.